Fall protection is one of the most important ways that every job site and construction management company should protect the employees working there. Construction safety is paramount throughout the year, and fall protection is one of the most important ways that every job site and construction management company should protect the employees working there. Slipping and tripping are some of the most dangerous things that can occur on a job site, but there are many different precautions you can take to make your construction site a safer place to be. According to a recent report from the US Department of Labor, slipping and tripping are the cause of most general industry accidents. General industry accidents are the cause of 15% of the total number of accidental deaths annually and 25% of all injury claims. A whopping 95 million work days are lost every year as a result of slips and trips. 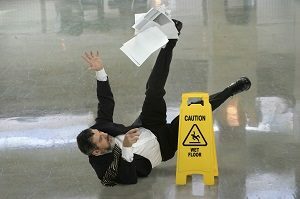 What Causes Falls and Slips? Keeping your workplace and construction site clean is important, as clutter, wet spots, and poorly maintained flooring are major causes of tripping and falling. Take the time to clean up your workplace when you arrive and when you leave, and encourage your workers to clean up after themselves regularly. If necessary, consider hiring a professional commercial cleaning company to keep your space tidy. Flooring is one of the biggest causes of trips and falls, so keeping them clean and dry is essential. Surfaces like parking lots, sidewalks, kitchens, bathrooms, and flooring in high-traffic areas are all common spots for slipping. Reduce falls on walking surfaces by using anti-skid paint or striping material, cleaning up snow and ice immediately, and placing signage around slick areas indoors to alert your employees. This entry was posted on Friday, October 20th, 2017	at 3:47 pm	. Both comments and pings are currently closed.